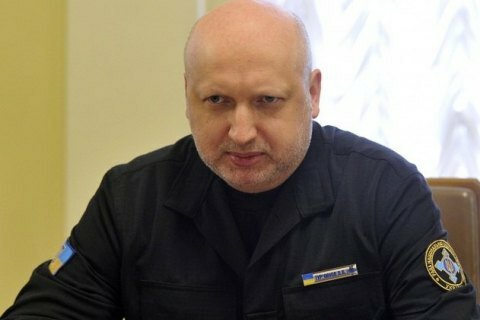 The NSDC Secretary Oleksandr Turchynov says the Council at during an emergency meeting on 14 March backed the proposal of President Poroshenko temporarily to suspend the transport communication with the occupied areas of Donetsk and Luhansk regions. "Recognizing the sharp escalation of Russian aggression against Ukraine, the forcible seizure of Ukrainian enterprises located on the territory of certain areas of Donetsk and Luhansk regions, realizing the aggravation of threats to economic and energy security of Ukraine provoked by the terrorists’ deliberate actions, and considering that the Russian Federation recognized at the state level ‘[travel] documents’ of the self-proclaimed republics; with the aim of protecting the rights and freedoms of citizens of Ukraine and ensuring Ukraine’s national security, the NSDC decided: provisionally, until the implementation of paragraphs 1-2 of the Set of Measures for the Implementation of the Minsk Agreements of February 12, 2015, as well as until the return of seized companies under Ukrainian jurisdiction, the movement of goods across the contact line shall be stopped," NSDC website quoted Turchynov as saying. The Cabinet of Ministers was instructed to urgently develop and introduce a plan of measures to ensure the safe and reliable operation of the fuel and energy and metallurgical complex of Ukraine, to analyze the negative impact of the situation on the economy and the national budget of the country and take measures to minimize them. The law enforcement agencies of Ukraine, including the National Police, the National Guard and the Security Service, are instructed to immediately stop the movement of goods across the contact line by rail and road and create conditions for attracting public control to implement this decision. On March 1, the terrorist organizations "DPR and "LPR" announced the beginning of "nationalization" of Ukrainian enterprises that are located in the territory controlled by the separatists. The militants took this decision in response to the civil blockade of three railway branches in Donbas.